When my sister-in-law visits from Seattle, she has a few requests: a trek around the Bend Ale Trail and a handful of the city’s best bars, then snow play or standup paddleboarding. Downtown Bend is a great spot to spend a day. But her chief request is for one full, gloriously uninterrupted day to explore Downtown Bend. I can’t say I blame her, since I’ve never tired of Downtown meandering in 21+ years of living here. If you’re new to the concept of devoting a full day to exploring this small but lively patch of our fair city, here’s a rundown on the best way to do Downtown Bend in a day. Downtown Bend is one of the most walkable areas in the city, so it’s smart to ditch your car as soon as possible. Swing by the Bend Visitor Center to snag brochures and get tips from a friendly volunteer. Aim for the parking garage on Lava Road, which offers the first three hours for free or $10 for the whole day. You’ll find other parking lots and street parking scattered around the Downtown core, but you can avoid the parking hassle altogether by walking, biking, or using Uber or Lyft to get you here. Bonus: You skip the construction crud that makes driving trickier this time of year. Even better, sleep right in the center of it all by booking a room Downtown. The Oxford Hotel, Doubletree by Hilton, the Bunk + Brew Hostel in the historic Lucas House, and Wall Street Suites are all terrific options in the Downtown core. Once you’re settled, swing by the Bend Visitor Center on the corner of Lava and Oregon to pick up free maps and chat with the friendly Visit Bend team about the best way to maximize your time in Bend. You’ve stashed your car and filled your brain with ideas, so now let’s fill your belly. 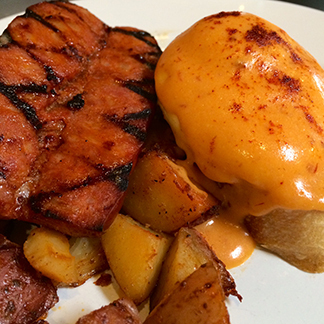 Linguiça and chipotle hollandaise add a little zing to your breakfast at Café Sintra. Downtown Bend offers tons of options for breakfast and brunch. The Lemon Tree specializes in clean, fresh, international fare like their jumbo lump crab cake benedict with citrus hollandaise (yum!) or Amaretto French Toast with slivered almonds and berry coulis. For a little Portuguese flair, head for Café Sintra to try their twist on classic eggs Benedict. It features two poached eggs and sliced Roma tomatoes over sourdough bread, served with their famous Sintra potatoes and your choice of linguica, Bavarian ham, or Italian sausage topped with chipotle hollandaise. If you dig breakfast you can sip on the go, head to Mother’s Juice Café for one of their mouthwatering smoothies, or pop across the street to Thump Coffee or Lone Pine Coffee to perk up your morning with a hot brewed beverage. With a steaming mug of caffeinated goodness in hand, it’s time to do some strolling. Meander alleyways and side streets for a look at the public art that’s part of the Tin Pan Alley Art Collection. Further your art fix by popping into some of Downtown’s hottest art galleries. Stop to admire the outdoor art that’s part of the Tin Pan Alley Art Collection in Downtown Bend. Now it’s time for souvenir shopping. Head for locally-owned boutiques like Clementine Urban Mercantile, Paper Jazz, and Navidi’s (their mini olive oils and balsamic vinegars make great gifts for folks back home!) Treat yourself to a new top at Hot Box Betty or a great new pair of jeans at Local Joe. You can even splurge on a facial or massage at one of Downtown’s day spas like Face to Face, Zante, or Azura Studio. Springtime in Bend brings unexpected bursts of sunshine along with construction season. While it would be distasteful of me to suggest you snag a seat outside to ogle the construction workers renovating the Mirror Pond parking lot, a good vantagepoint to do that would be Worthy Taps and Tacos. Opt for their taco trio, which lets you sample three different mouthwatering combinations, or head for Barrio just down the street for another twist on tasty tacos. Yummy Northern Thai food served family style at White Rose. For even more international flare, head for the Indian buffet at Taj Palace or one of three Thai restaurants in Downtown Bend. 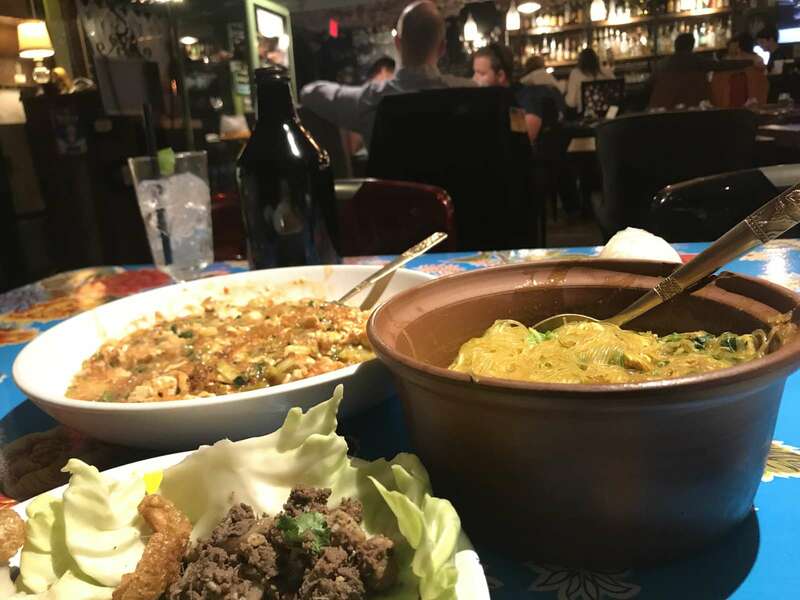 Noi and Toomies specialize in Southern Thai dishes like Pad Thai and curries, while Wild Rose specializes in Northern Thai cuisine including sticky jasmine rice you dip in fresh chili paste and eat with your hands. Since you’re on vacation, seize the chance to pair a beer with lunch while gathering a couple Bend Ale Trail passport stamps. Deschutes Brewery and Bend Brewing Company are both in the Downtown core, and boast lunch menus guaranteed to fill your belly with goodness. One of the nicest things about Downtown Bend is that it’s fringed by the crown jewel of Bend’s park system. Drake Park is just a few steps down from Mirror Pond Plaza near Crow’s Feet Commons, so cap off your lunch break with a leisurely stroll around this 13-acre waterfront paradise. 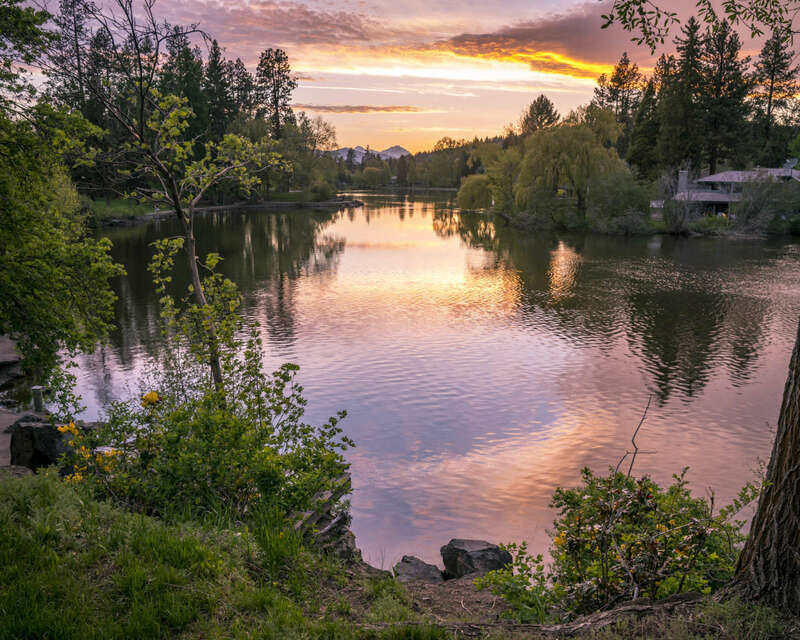 Stroll through Drake Park to enjoy killer views of the Deschutes River. Find a cozy bench to watch ducks and geese paddling around Mirror Pond, or venture across the footbridge into historic Pageant Park. If the weather’s warm, grab a scoop or four to enjoy from Bontá Artisan Gelato while you savor the sunshine sparkling on the mighty Deschutes. History buffs will enjoy the historical plaques scattered around the parks as well as on Downtown landmarks like the Tower Theatre and Lone Crow Bungalow. Hop over to the Deschutes Historical Museum to really revel in local history, or even join a guided walking tour. Fortified by fresh air and exercise, you can log another hour or two of shopping at Downtown boutiques like the Sunstone Store for some local bling or Cowgirl Cash where you can score a great pair of vintage boots. 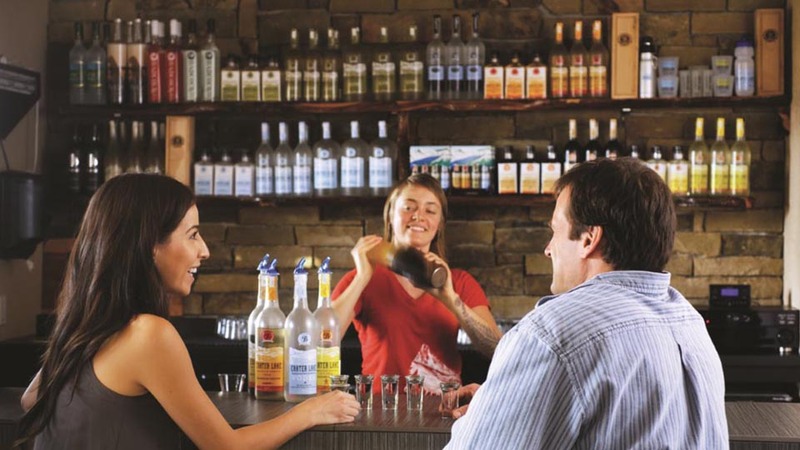 Sample scrumptious locally-crafted vodka, gin, and whiskey at the Crater Lake Sprits Downtown Tasting room. Then it’s time for cocktail hour! (And by “hour” I mean treat yourself to a solid 180-minutes or so). Kick things off in the tasting room at the Crater Lake Spirits Downtown Tasting Room where you can sample locally-produced vodka, gin, rye, whiskey, and more. Sip one of their housemade cocktails and make plans to visit their distillery later in your Bend vacay. Now that you’ve gotten things started, head for one of Bend’s best happy hour hotspots. Dogwood Cocktail Cabin boasts some of the most creative cocktail offerings in town, including the Herban Cowboy (black pepper infused bourbon, Fernet Branca, pomegranate, molasses, black licorice, and orange peel) or the Bluebird (Aria, elderflower liqueur, blueberries, and cava on the rocks). An order of their dirty popcorn will put something in your belly to help slow your roll. Astro Lounge is another local fave, with a happy hour that extends until 7 p.m. and specials like the Latin Lover (muddled basil, fresh lemon, pineapple juice, and Crater Lake vodka infused with habanero and basil) or the Grandpa Steens (Four Roses, fresh grapefruit, champagne, and a float of Peychauds and peach bitters). For nibbles, grab the pork belly wanton nachos and the sweet potato fries. When dinnertime rolls around, you’ve got plenty of award-winning dining options to choose from. Try 900 Wall for an eclectic blend of Italian, French, and modern American influences. A beef carpaccio starter and a warm kale salad will pair well with any entrée you choose, and their creative veggie side dishes offer tasty ways to feel smug and superior about your healthy life choices. 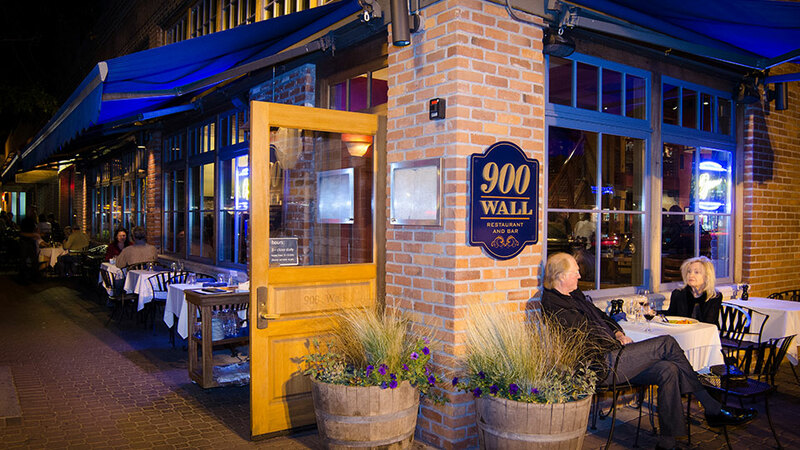 If the weather’s warm, you can even dine outside at 900 Wall. Hit Drake for a creative, upscale twist on diner food (their shrimp and grits will leave you swooning) or Zydeco for Northwest cuisine with a Southern twist and oodles of great gluten-free choices (their blackened redfish is to die for). 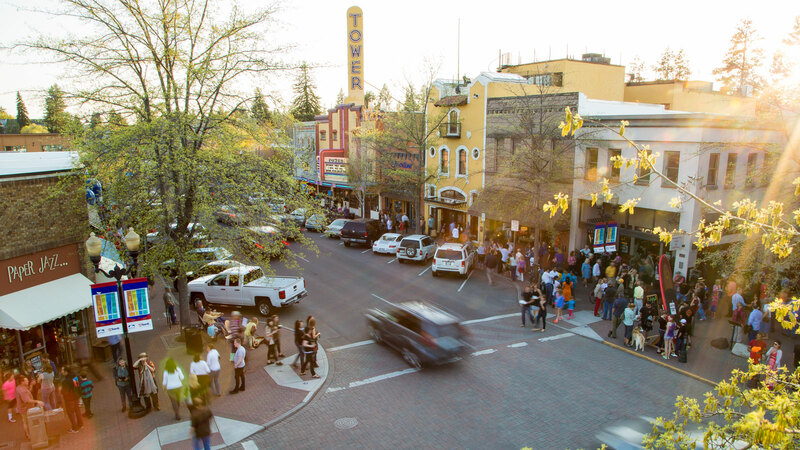 After your meal, catch a show at the historic Tower Theatre or check the Visit Bend event calendar to see who’s got live music that night. Not ready to turn in just yet? Both 10 Below and the Blacksmith boast late-night happy hours that’ll let you save a few bucks while grabbing one last nightcap and snack. Feeling inspired to plan your own adventure in Downtown Bend? We’ve got a prize package that includes two full-day bike rentals from Crow’s Feet Commons and $50 to spend at 900 Wall. Enter to win by commenting on this post with at least three things you’d love to see and do while you’re in Bend. We’ll draw a winner on Thursday, April 11, 2019. Excited about your fun day exploring downtown Bend? 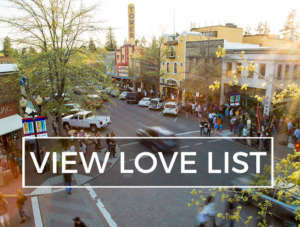 Click below to view Visit Bend’s love list for a more visual guide to the perfect spring day in downtown Bend. You can even love it and share it with your friends! Deschutes Brewery, Azura Spa and Drake Park! We’d love to wander and look at art galleries and public art, rent some bikes and try out a mtn bike trail, and eat way too much Indian food at Mantra. ❤️ Bend! When in Bend….I love to go on a waterfall hike, eat the barbecue shrimp at Zydeco, and kayak on Hosmer Lake. Heading to Bend 4/17. Will be my first time vacationing there. Planning on the Old Mill District and just added Downtown Bend to the list while we’re there. As for the third thing (or more)… any suggestions? Hiking, off-reading, probably too cold for any river activities… What’s a “must see/do” while we’re there? Family trip. Things to do and see downtown (especially in the summer! ): shopping the Wednesday farmer’s market, soaking in the McMenamin’s salt water pool, grabbing a sweet treat at Bonta, and grabbing a nightcap at 10Below. So many amazing things to Downtown! Visiting the McMenamin’s soaking pool, getting something sweet at Bonta, or a nightcap at 10Below are my recommendations. Definitely want to try the spirits at crater lake distillery! And you can’t beat the delicious coffee at Thump! Looking forward to strolling around Drake Park with my daughter and of course hiking the great trails all around Bend! My family and I will be there in a couple weeks. Thanks for the great ideas. We are looking forward to our vacation. I will be visiting visitors place…didn’t even know it was there! Parking garage is so nice and cheap…I guest that will be busy while construction is going on! Art galleries are on my list…all of it actually..I will follow your plan..thank you! I’d love to hear some live music! Gelato is great at Bonta! I’d like to see a show at Tower Theater! I’d love to see some cute shops, yummy food on my plate, and a smile on the faces of my family. I’d love to take my family on a bike ride along the river, eat at 900 Walll, and swim at one of the many lakes around here. Float the river, catch a show at the amphitheater, and enjoy some Bend brews. Hike the Badlands, eat at Wildrose, and visit a couple of the amazing parks in Bend! Take a walk on the Dechutes River, take paddle board out by the Old Mill & enjoy brews & food at Bend Brewing! Paddleboard through downtown, grab a beer at Deschutes and see a concert at the Tower. I like parking by Drake Park and then walking through the breezeway with the art, then just wandering around downtown, seeing the art and eating whatever comes along. Even better if there is something like the Summer Festival going on. If i have time I like to walk along the river and over the bridge and watch t he floaters and if I have more time, floating the river myself. I’d go to the Tower for a show, Bronwen’s Jewelry Shop and the Museum! Only three!? 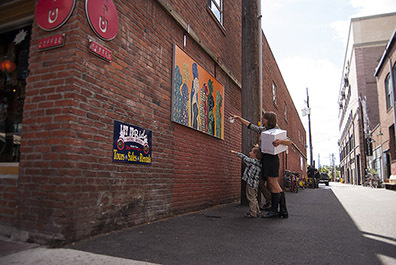 I would love to take my partner, who is an artist, to see Bend’s Tin Alley Art Collection, spend an afternoon beside the Deschutes, and explore beers along the Bend Ale Trail. Congratulations, Kelly Moran! 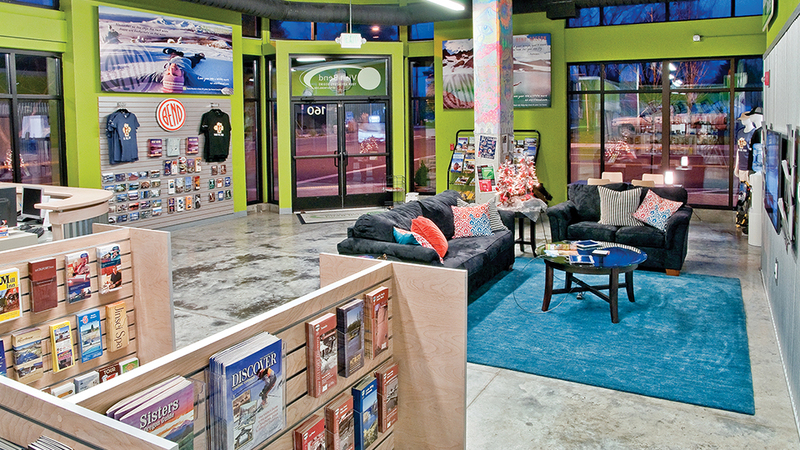 We drew your name to win the two bike rental gift cards from Crow’s Feet Commons plus $50 to spend at 900 Wall. Please email tawna@visitbend.com and we’ll make arrangements to get your prize to you. Cheers! I would love to soak in the pools at Mcmennamins, take my SUP on the Deschutes and actually complete the Bend Ale Trail! Drinks at 10Below, walking through the Wednesday farmer’s market, and checking out Mockingbird Gallery’s art. Smith rock, local beer, frolicking downtown during happy hour, and catching up with the bunk+brew crew! So many more than 3 things to see and do while in Bend. We would love to spend a day strolling around the stores downtown and enjoy the beauty of Drake Park by bike rentals from Crows Feet Commons. Dinner and then over to check out the Crater Lake Tasting room as we have never been! 10 Below has a fabulous Happy Hour 2pm – 6pm and then again from 9pm until close! Fire pits outside of McMenamins are always a fantastic way to finish out a day as well. I’ve heard through the “grapevine” that Bend is the go to place , so I have booked a trip in two weeks to see for myself. Can’t wait ! Some tasty Thai food from Noi, check out the art glass at Piece of Mind, Wednesday Farmer’s Market!